Who Are the Dominican Associates? There are no “rules” or “standards” common to all Dominican congregations regarding how one becomes an Associate. Because Associates began as a grass-roots movement responding to the desire of non-vowed persons to be connected with a particular congregation, each congregation developed their own formation process independently of others. Some have a sort of “independent study” with a vowed member that takes place over at least a year. Others have a group process that includes involvement of vowed members and experienced Associates and also extends over the period of at least a year. What all congregations do have in common is that there is some sort of formation process and a commitment or covenant ceremony that “officializes” the Associate’s connection with the congregation. The Associates of some congregations make permanent commitments from the very beginning while others make temporary commitments which may eventually lead to a lifetime commitment. Some Associate Programs have the Associates as “free agents,” participating in whatever activities and groups the congregation is involved with. 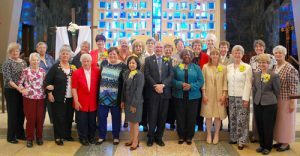 Others have “Associate Groups,” that may or may not include vowed members, which meet usually on a monthly basis for shared prayer, study, support in living the Dominican charism and mission, and social activities. The level of participation of Associates in the life and activities of a congregation vary widely between congregations. Some are limited to sharing in common prayer, study days and volunteer activities within a congregation; while others are fully incorporated into the life of the community, even to planning and attending all sessions of the congregation’s General Chapter. Associates do NOT have voting privileges, of course, as that is a canonical responsibility. Associates do not make promises, as do the Dominican Laity, to do any particular things, like pray the Divine Office, for instance. Commitment is to the Dominican mission and charism, and for each of us living as Dominicans looks very different according to our own gifts, talents and passions.